For some reason the folks at Frankenmuth Brewery decided that they’d spell beer the German way for their root beer. Interestingly they didn’t use any other German words. I guess they’re just a little bit German. There’s a wiener dog on the label and supposedly the brewery was also originally known for its purebred Dachshunds. But the brewmeister grew tired of the walking sausages and needed to get rid of them. He convinced a local boy to take them in exchange for the fresh root beer. I’m wondering just what the exact terms of the contract was. Hopefully the boy was getting more than a case, like maybe a 6 pack a week or a free frosty mug every time he showed up or something for as long as the dogs were alive. Then the name Frankie is either from the boy, the dogs, or hot dogs (franks), at least according to the bottle. They were probably very disappointed that III Dachsunds Root Beer was already taken, and they had to come up with another name. This is another brew that boasts “Michigan Beet Sugar” Those Michiganders must really love their beets. The Body is fruity, really fruity, with a decent amount of vanilla. It’s also kind of sour and not very strong. It’s a very smooth brew without a lot of Bite to it. The Head has a good height but lacks the staying power to really be great. It’s alright. The Aftertaste is more fruity vanilla. I never was a fan of sour fruity root beers. That boy must have been or the whole trade deal wouldn’t have made much sense. To each their own I suppose. See how it rates against other root beers. This brew comes from Spike’s Junkyard Dogs, a hotdog restaurant chain in Rhode Island, Massachusetts, and Connecticut. From the looks of their site they make some pretty epic all natural fresh hotdogs and claim to be the “World’s Best Hotdog-Maybe Better!” I’m sure they’re better than anything you can get on the International Space Station so why not? 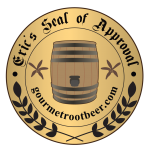 The brew itself is made by Empire Bottling Works to “[their] specification, bottled in 12oz. brown bottles, privately labeled, and available only in [their] stores. It’s and old fashioned ‘adult’ root beer – less sweet, less foamy, and a nice finish” According to the “Top Dog” Ok, I know I’m overdoing it on the quotes this time. Sorry. The ingredients to confirm it’s different than any of the other root beers I’ve had coming out of the Empire. They opted to go with the dog theme for their chain and root beer, even putting a dog on the label, though that fits a lot better with them than with a lot of others. When it arrived my wife I saw a large dark, wet looking splotch covering the whole bottom corner of the box. I flew into a rage at the postal service destroying yet more of my precious root beers and quickly opened the box to reveal perfectly dry and intact contents. The mark was a huge grease stain, no doubt from the hotdogs. Brilliant Spike, give me a heart attack. This has a dark Body with a dominant sassafras flavor. The cane sugar is evident as well as the slightest whiff of wintergreen and that’s it. No creamy, no spicy, no licorice-y no nothing. It isn’t overly sweet yet just barely sweet enough. It’s very simple. The Bite is simple as well, some carbonation burn and that’s really it. It is nice and smooth from start to finish. The Head is very tall and decently frothy. It fizzes down at a moderate pace but still leaves traces of foam to the very end. The Aftertaste is some more sassafras with the tiniest bit of wintergreen. There is nothing unpleasant about this brew. It’s got a solid root beer core without the slightest extra bit of accents, the complete opposite of the Intergalactic Root Beer I had right before it. This is a root beer that everyone will like, but I doubt anyone will truly love. There’s just nothing extra whatsoever. They say on the label that it’s best when you “lap it up while dining on one of Spike’s World Famous Junkyard Hot Dogs” and I’m inclined to believe them. See how it rates against other root beers.